This extraordinary export from the Aceh region is a quintessential example of Gayo coffee. The wet-hulled, sun-dried process creates an earthy, complex flavor profile that is unlike any other coffee. The Gayo is sharper and brighter than our Lintong and makes an excellent espresso base. Whereas Lintong has a warm, compelling aroma, the Gayo is bold and assertive, with none of the muddiness that tends to characterize Mandheling. 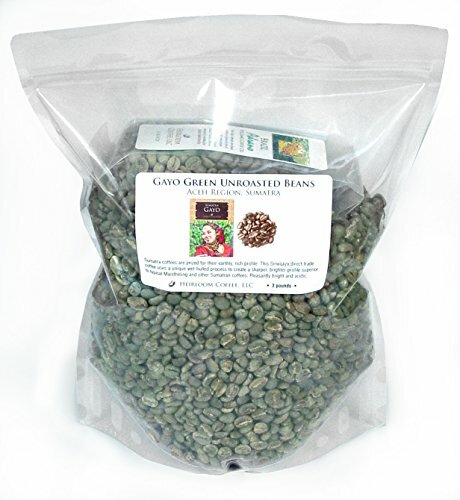 This is an excellent choice if you love the Sumatra profile and want to try a very clean sun-dried, wet-hulled coffee. People who like the Gayo also tend to enjoy our Lintong. NOTE: This order is being fulfilled by merchant until new stock arrives at FBA for Prime shipping. We guarantee delivery before Christmas on all orders placed by Dec. 18 or you will receive a full refund!